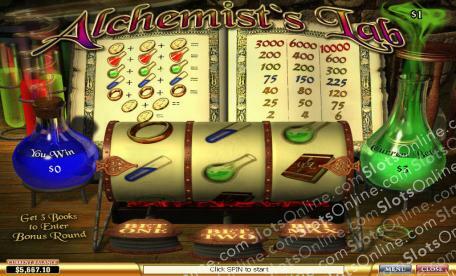 Discover the fantastical secrets of alchemy in the Alchemist's Lab. Click here to play! Will you stumble upon the formula to eternal life or perhaps overcome the ancient alchemist's challenge of turning common materials into precious gold? Only grim experimentation with that which humankind was not meant to what of will reveal the extent of your alchemical genius. Coins and rings forged from alchemical gold can be yours to make for untold riches, but the alchemist's path is often harder. While many of your concoctions will likely result in little more than smoke and bubbling beakers, tomes of untold knowledge will occasionally reveal insights into the darkest and most rewarding corridors of the alchemical academics. When three books are aligned, your formula for the creation of pure gold will come one step closer to perfection � and only you shall reap the rewards! No worthy knowledge comes without its price, though, and the potential rewards of the Alchemist's Lab increase dramatically for those willing to risk more than others. Do you dare to brave the terrible secrets of the Alchemist's Lab? When 3 books line up, you will get to choose three potions to mix together to create gold. Choose the right ones for the biggest bonus win.